Summer is coming, friends and that means sun and fun and schlepping your entire family to the beach. We all know that a family vacation REALLY isn’t a vacation for you, right? 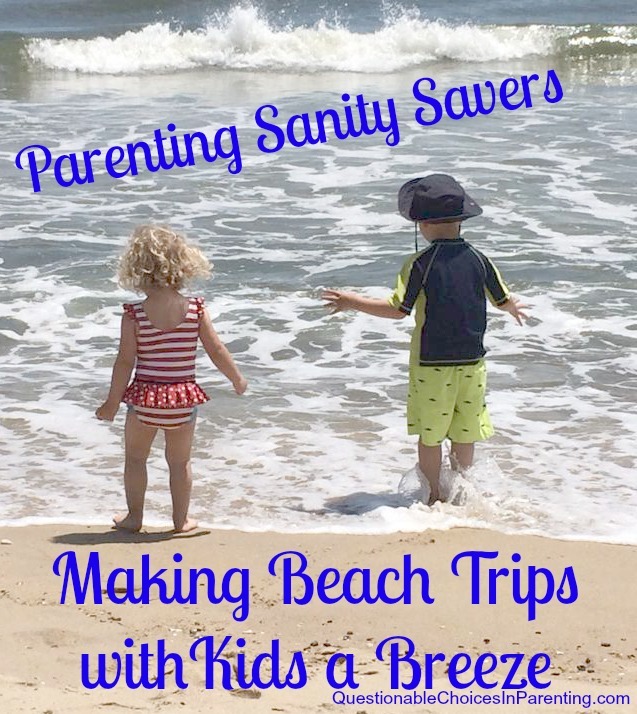 It’s more of a working vacation, but if you have plans to take your kids to the beach, I’ve got a few sanity savers to make your beach vacay a breeze. Maybe not a breeze but a whole lot little easier. Lookout beach, here we come! Use a mesh laundry bag (grab one at the Dollar Store!) and load up all of your kids’ sand toys, buckets and shovels. 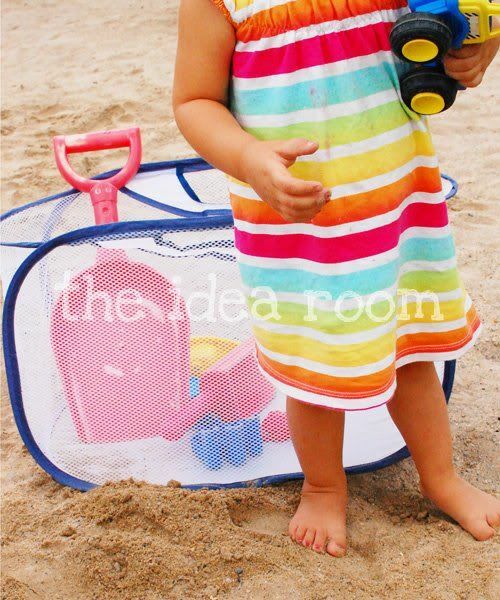 The lightweight bag is easy to carry or drag up or down the beach so even your older kids can be in charge of this bag. Before you head inside, rinse everything right in the bag in an outdoor shower or hose! You can let the bag drip dry on the balcony or deck and have it ready to go for the next day! 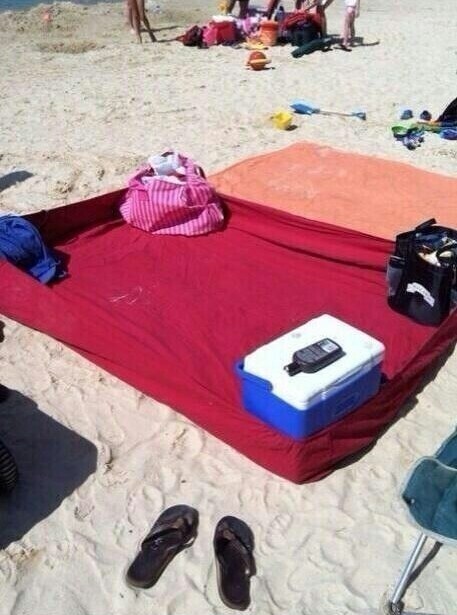 An easy way to keep sand from overtaking your beach blanket is to ditch the blanket and grab a fitted sheet. Flip the sheet upside down and in each corner put a bag or cooler so the sides of the sheet are flipped up. You just created a little barrier from the sand–at least for a little bit. Want the sand off but don’t have a place to rinse off? No problem! Stash a bottle of baby powder in your beach bag and sprinkle away. The sand magically falls off and who doesn’t love the smell of baby powder? If your kids get a little over zealous with the sprinkle part, fill a child sized knee sock with baby power and tie it off with a ribbon. 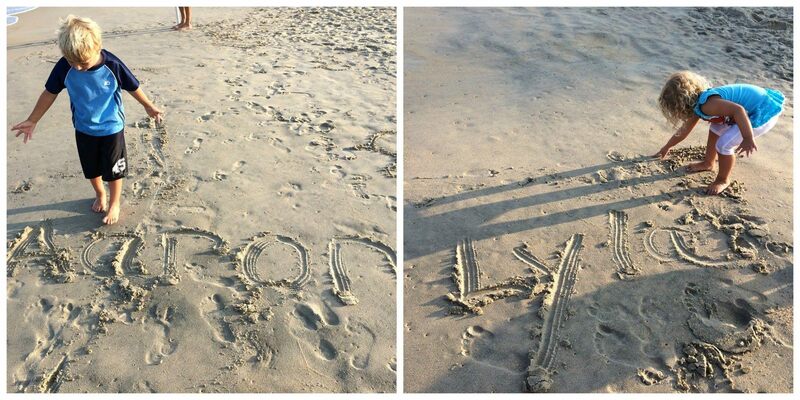 You’ve created a sand-be-gone-sack. Silly name but sandless hands and feet! A very important item you need for the beach are dog poo bags. Yes dog poo bags. Throw a roll of these bags into your beach bag for wet bathing suits, dirty diapers, sunblock explosions, taking home seashells, and every other mess or blowout you can and can’t plan for. The bags are small but super handy. Pool noodles are super fun during the day while your kids are splashing around, but dry them off at night and tuck them under a fitted sheet on a bed and they work like a bumper for you kids. No need to move furniture or bring a bed rail, just use your noodle! Sandy cellphones are no fun. So put your phone inside a plastic bag to keep the sand out but you can still use the buttons! A day of cannonballs into the pool or dives into the ocean can lead to water in your kid’s ears. Ouch! Have them blow up a balloon for instant relief from the clogged ear! Fill the other balloons with water and freeze overnight. Use the frozen balloon in your cooler during the day and in the afternoon have a fun water balloon race on the beach with the family. Fun and functional, I like it. Save the lid to your take-out coffee, flip it upside down, and put the stick of a Popsicle in the drink hole and ta-dah–the lid catches drips and your kiddos little hands stay clean! 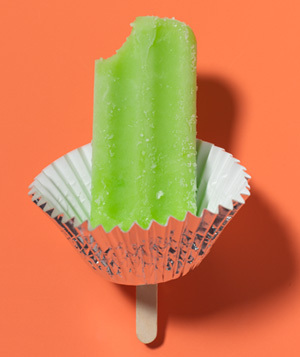 You can also use a cupcake liner for this trick. 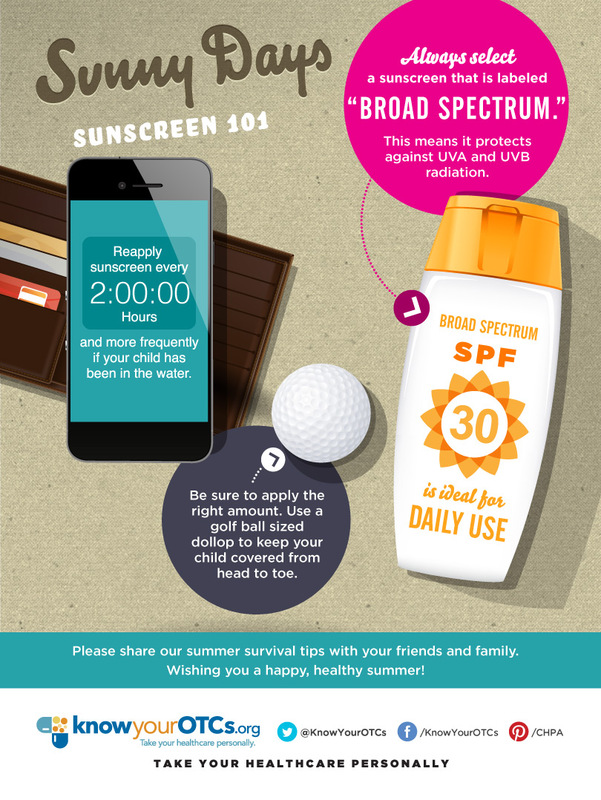 Protect your kiddo’s precious skin and reapply sunscreen every two hours (less if they have been in the water). To remind yourself, set the alarm on your phone, download an app(you can find lots of free apps), or write on the back of sunscreen bottle the times you need to reapply. 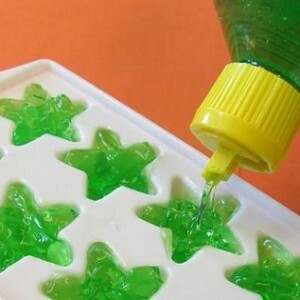 Freeze aloe vera in ice-cube trays for cool relief or put the entire bottle in the fridge for a quick cool down. Most important tip take grandparents…. kidding, kinda. OK, most important tip Have SO MUCH Fun! Look out beach, here we come! We also had a small bottle of vinegar when visiting NC beaches… it helps with jellyfish stings! These are great tips. I got sand all in my phone once. OMG, was that a pain! These are really great ideas. I will have to do the fitted sheet trick next time we go to the beach. We spend a LOT of time at the beach in the summer. You pretty much hit the nail on the head. These are fantastic beach tips. I’ve never heard of using baby powder to get rid of sand, I can’t wait to go to the beach and try that out. Wow these are serious parenting hacks. I love your ideas. These would make beach day much more relaxing. Love the idea of freezing aloe. My family burns so easy. This is great! The beach has always been a huge strstressful trip for me. It’s a bit of a ways away so taking 6 kids can be hard…. But this is super helpful! I like the idea of blowing up the balloon for water in the ears. I may have to do that for myself as well. That fitted sheet tip is awesome. I can’t believe I have never seen that before! These are great tips for having the kids at the beach. I will have to try freezing aloe vera in ice-cube trays for those sun burns. Great ideas! We used to live near the beach and I would have loved this list then, I always ended up forgetting things! We are at the beach all the time in Florida! These are super handy tips!